Haha, I still couldn't believe it! 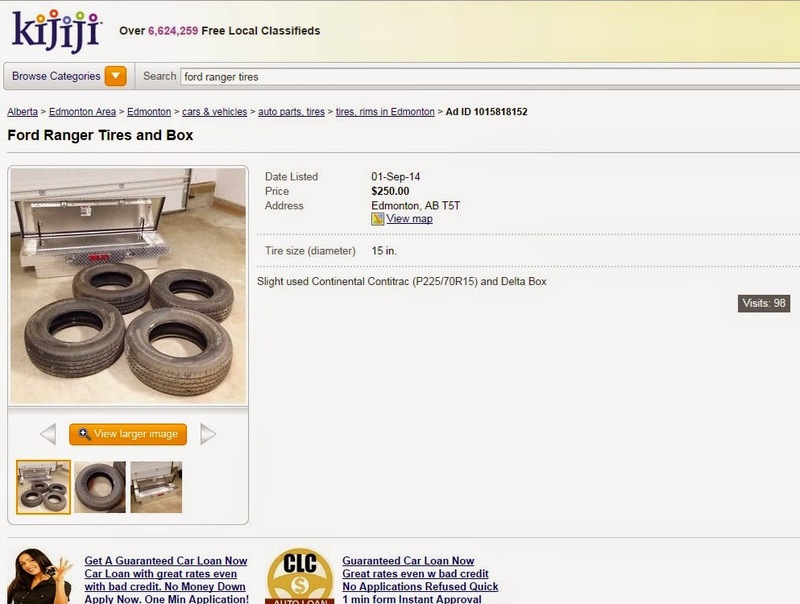 Ford was able to sell these tires and aluminum box in Kijiji! I was actually very skeptic when he asked me to take pictures of his "merchandise." He's had these tires in 2011 pa when he bought his Ford Ranger. But only after a few months use, he replaced them with all-weather tires. Hence, naging kalat na lang sa parking spot niya sa building and later dito sa garahe sa house ang mga gulong na ito. He finally had the guts to sell them when we finally let go of the truck last August 29. Naiwan din kasi yung aluminum box ng Ranger so kailangan idispose para hindi makasikip sa garahe. Ford created an account in Kijiji, an online classified ads here in Canada (which I later learned is a subsidiary pala of eBay), last September. He offered the items for a very low price of $250 para maibenta na lang. And after 11 days, he's sold it! Haha, di ako makapaniwala! Ford was so happy! Ngayon lang siya nagbenta ng gamit niya ever at na-excite siya. He's had those tires since 2011, bakit ngayon lang niya naisip ibenta sa Kijiji??? And now nag-iisip pa siya kung ano ang ibebenta. Pati yata ako gustong i-post haha! However, I think Ford won't be a good seller. He couldn't negotiate eh. The buyer haggled for $220 and he said yes. I told him sayang ang $30! The buyer was already interested kasi good deal na nga and his goods were really in excellent condition so sana hindi na siya nagpatawad. He couldn't say no daw eh, kaloka! Next time, ako na nga lang ang fo-front. Walang maaasahan sa asawa ko. He needs me in his life sa totoo lang!